Car accidents can result in extremely severe injuries that have a lifelong impact on victims. If you have been injured in a car accident that was caused due to the negligence of another driver, it is essential that you seek the assistance of a qualified personal injury attorney. At the law firm of Mark A. McLaughlin, we provide strong representation to injury victims throughout the Northern California (Antioch, Pittsburg, Brentwood, Concord, Oakland, and San Francisco and ….) area. 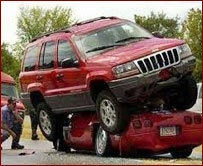 We have extensive experience handling all types of car accident cases for our clients. We fight to hold the negligent parties accountable and seek maximum compensation for your injuries. If you have been injured in a Car Accident, don't talk to anyone from the insurance company. Refer all their questions to us, and let us handle them for you. Our Northern California (Antioch, Pittsburg, Brentwood, Concord, Oakland, San Francisco, and ….) Car Accident law office/firm will provide the necessary information without compromising your claim for compensation. Call today for free Consultation, Contact our office today to discuss your car accident injuries. We are available during regular business hours and by appointment evenings and weekends. You can reach us by phone at (925) 754-2622 or via e-mail. We take every personal injury case on a contingency basis which means that you don't pay any attorney's fees unless we recover compensation for you.